Dr Andrew Howells has created a series of 60 illustrations that assist scientists to visually assess the health of captive Asian elephants. Now he is looking to expand this work to other species in captivity. After years working in animation, graphic design and later as a freelance illustrator, it was a conversation with a veterinary science friend that sparked Andrew’s interest in completing a PhD in Natural History Illustration. “My friend, Dr Roy McClements, was a very tall man and he was researching penguins. So I thought it would be a great composition for a portrait. I did a life size portrait of him for a portrait competition, and while he was sitting for it we were talking about his research,” Andrew recalls. “I said, ‘what’s next’ and he said, ‘elephants’. “He and his colleagues had identified nine different conditions that an elephant could be categorised, from emaciated through to obese, so they thought they would collate a whole collection of photographs describing those different conditions. That’s why the role of the illustrator is so important. We can take what is unseeable and make it ‘seeable’. It is a really descriptive role that is all based on being accurate in representing and contextualising factual information. This led Andrew to complete a Research Masters and, later, a PhD in Natural History Illustration at the University of Newcastle. The discipline of Natural History Illustration has been around for a long time, and the relationship between scientist and natural history illustrator is historically founded. However, Newcastle currently has the only degree program in Natural History Illustration in Australia, and is one of only a few internationally. For the elephant project, Andrew spent four years working from information provided by scientists and photographs, as well as observing the elephants at Taronga Zoo in Sydney, Australia, and at the Fort Worth Zoo in Texas, US. 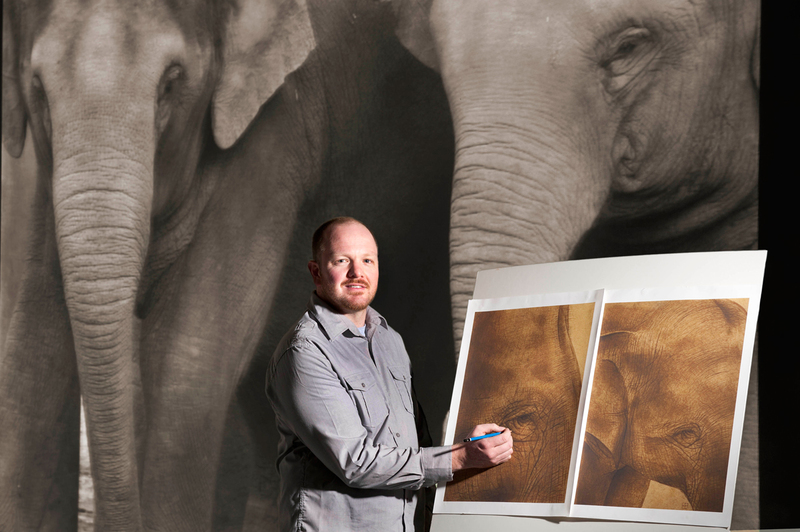 “After I had the chance to study elephants in Australia and get some ideas on paper, then I worked with researchers in the US to look at their elephants and have a discussion about how to really refine the drawings to describe specific anatomical detail. From there, it was up to me to take it to the next level and create the resource set,” he explained. “I would like to create resources across a range of species that are an active part of research in the conservation space. Dr Andrew Howells has created a series of 60 illustrations that assist scientists to visually assess the health of captive Asian elephants.